One of the most common questions I get is "Do you use a laser or scissor method to perform infant tongue/lip tie release to help with breastfeeding problems?" My typical response is "both," but depending on several factors, I will be swayed to use one method over another. 1) How thick or deep is the tongue/lip tie? 2) How much bleeding is anticipated? 3) How quickly can the procedure be performed? 4) Does the risks outweigh the benefits of one method over another? Both techniques can be performed in the office without any sedation. Both techniques can be performed relatively quickly. 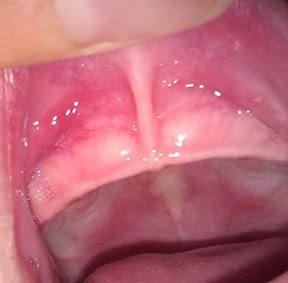 Both techniques result in minimal pain afterwards (teething gel is typically sufficient if even that). Both techniques may employ topical or injected local anesthetic. Both techniques can be performed in infants and adults with equivalent ease. Given both techniques are so similar, what determines which method is "better?" Regardless of my personal preference, if a patient/family strongly desires one method over another, I'm always happy to oblige because honestly, the end result is essentially the same no matter what method is used and I'm equally comfortable using either the laser or scissor. But my personal bias is to use the scissor method mainly because it is MUCH faster to perform than the laser method and when you are dealing with a squirming, screaming newborn, anything that can be done to minimize the duration is beneficial for all. However, if significant bleeding is anticipated, a laser is preferred in spite of the longer procedure duration as it both cuts and stops bleeding simultaneously. With scissor technique, the bleeding may take up to 10 minutes to stop, and if it does not, cauterization may need to be performed. Such bleeding concern is heightened if the tongue/upper lip tie is thick or if a posterior tongue tie is present given dissection under the surface is required. Can Parent be with Baby? Although healing appears to be identical after using either the laser or scissor technique, there is one caveat when this does not appear to be true. In the event that the scissor technique is used and bleeding is not able to be controlled with pressure alone, silver nitrate or even bipolar electrocautery may be required to stop the bleeding. Should such cauterization be required after scissor release, healing does appear to be more prolonged and difficult compared to laser. Please understand that this is just my opinion and there are practitioners out there who ONLY use laser and others who ONLY use the scissor technique due to perceived superiority of one over the other. I personally utilize the best technique for a given circumstance and not just one technique for everything.